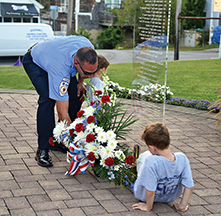 Acushnet firefighter Eric Arruda and two of his three sons, Mason and Bryce, place flowers at the 9-11 Memorial in Acushnet in honor of those who were killed during the terrorist attacks on 9/11/01, during a ceremony on Tuesday, 9/11/18. The memorial includes a piece of metal from the Twin Towers terrorism site. Photo by Glenn C. Silva. About 200 people gathered on the lawn of the Acushnet Fire Station for the seventh annual night of remem­brance on Tuesday, 9/11, at the site of the Acushnet 9-11 memorial. The memorial includes a piece of metal from the Twin Towers terrorism site. The 6 p.m. ceremony followed a 5:15 p.m. Requiem Mass by Fr. Riley Williams across the street at St. Francis Xavier Church, for those killed in the attacks of 9/11/01. The Acushnet Lions Club teamed up this year with the Acushnet Fire & E.M.S. for “Light for Sight,” a program where tea light candles are lit in personalized votive holders with the names of individuals that have passed away. Throughout the service Jared Alves read approximately 200 names in the background. The theme of the night was “Community.” Chief Gallagher spoke about the “Purple Army Project.” He said the goal is to reduce the number of purple flags on the fire station lawn: Each one represents a person who died from opioids in the past year. 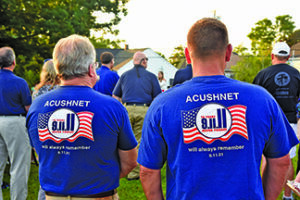 Members of the Acushnet Lions Club wear t-shirts declaring “never forget” at a ceremony in Acushnet on Tuesday, 9/11/18, commemoriating the 17th anniversary of the terrorist attacks of 9/11/01. Photo by Glenn C. Silva. awareness program back in August of 2015; the town also started “Acushnet Cares” in September of 2015, which involves in home visits by medical and clergy to those troubled by addiction. In January 2018 the town got a non-opioid drug on the ambulance and the town now has a machine to destroy needles and no longer has to send them out to be destroyed. Lastly the town has been distributing “Deactivation Pouches” to help people get rid of non-used drugs. To conclude the ceremony Acushnet firefighter Eric Arruda and two of his three sons, Mason and Bryce, placed flowers at the memorial in honor of those lost during the 9-11 attacks, and the flag was raised back up from half-mast by Lieutenant Zachary Stupalski. Approximately 200 candles are lit in memory of people that have died as part of the Acushnet Lions Light for Sight initiative during the 9-11 ceremony held at the 9-11 Memorial in Acusnet on Tuesday 9/11/18. Photo by Glenn C. Silva. Tori Kalisz closed out the event with a great rendition of “God Bless America” accompanied by those on hand. 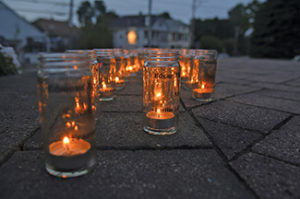 Candles may be purchased for $5 for next year’s memorial service. 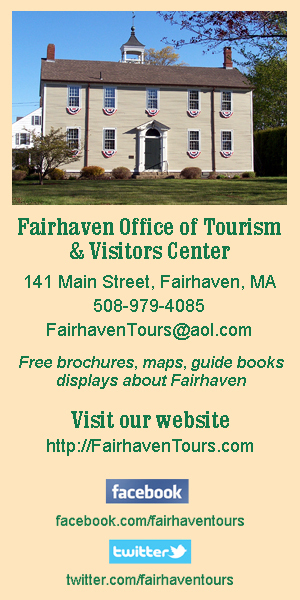 Please contact a member of the Acushnet Lions Club for more information. On September 11, 2001, the United States was attacked by terrorists who crashed two planes into the World Trade Center Towers in New York City, which resulted in the towers collapsing; crashed a plane into the Pentagon; and tried to crash a fourth plane, whose target is unknown, because passengers had heard about the previous crashes and thwarted the hijackers, although everyone on board died when the plane crashed in a field in Shanksville, Pennsylvania. Nearly 3,000 people were killed in the attacks. 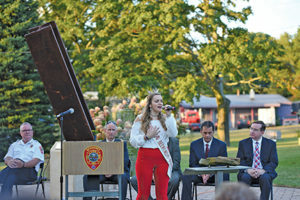 With a piece of metal from the Twin Towers terrorism site nearby, Tori Kalisz, Miss New Bedford Outstanding Teen, sings “Tears in Heaven” by Eric Clapton during the ceremony held at the Acushnet 9-11 Memorial, on Tuesday, 9/11/18. Photo by Glenn C. Silva.